After the accident, champion swimmer Todd Arliss became a savage, razor-toothed predator! I love the utter vaguery of that bio. "After... the accident, *dun-dun-dun! *" If you don't know what "the accident" was, this box isn't going to tell you. We will, though. We'll tell you three years ago! He was an Olympic swimmer planning to make a fortune from endorsements. Figuring he'd make even more if he was a hero, he attempted to save a man who had fallen overboard; but a wave smashed him against the ship, injuring his spine. Really, it's his own fault for taking a boat home from the Olympics. What, did the team not want to spring for airfare? Anyway, he then fell in with one of Namor's enemies, who experimented on him and turned him into this. And you thought Caitlyn Jenner changed! Tiger Shark's face looks great. Hasbro doesn't credit their sculptors, but someone did a top-notch job here. Tig's mouth is pulled back in a huge frown, revealing 17 razor-sharp teeth (eight on top, nine on the bottom). His ears poke out of his mask, and his brow is bunched up so hard that you can make out every wrinkle on his forehead. One of the defining features of Tiger Shark's costume is that he has a giant fin on top of his mask, kind of like Savage Dragon. 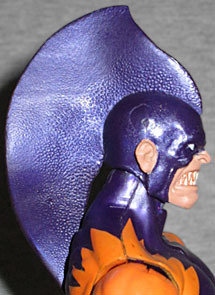 Here it's a separate piece glued into the scalp, and it takes the figure all the way up to the 7½" mark. Recognizing that the toy would probably get warped, they just went ahead and sculpted the fin with a slight wave to it, rather than trying to make it straight. There's also a texture on it: very nubbly right near the head, but smoothing out as you move farther away. It's nicely done. Tiger Shark is the latest figure to use Hasbro's "big" body, a perfectly suitable choice for this giant meathead. He gets Sabretooth's clawed hands, but is otherwise just the standard body. 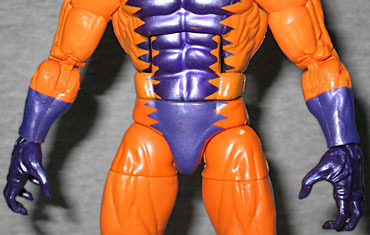 He's painted his hideous orange and purple, but the colors are a little bit off: the arms and legs are lighter than the torso, and the lower chest is darker than the rest of him. But hey, it's hard to perfectly match painted and cast colors, so we're not judging - just reporting. The articulation is the norm, except that the fin keeps his head from tilting backwards. That normally wouldn't be a big issue, but remember, Tiger Shark is a swimmer; he needs to look up just as much as a character who can fly. Tiger Shark doesn't have any accessories, but he does have the right arm of this series' Build-A-Figure, Ultron. As far as we can tell, Ultron and Tiger Shark have never worked together, but this is the movie version anyway. Tiger Shark is not a character who seems primed to receive a Marvel Legend. He hasn't had any big stories lately, he's not in any of the movies or TV shows, he has nothing to do with Ant-Man... basically, they made him "just because." Some fans are complaining they have to buy him to finish Ultron, but we choose to look at it as we get to buy him. Bring on the obscure villains!